A free-form, not politically-correct discussion rooted in reason--and humor--around thought-provoking topics hosted by TV personality, entrepreneur, investor and New York Times bestselling author, Carol Roth, covering current events and politics, individual rights, business, entertainment and more. You're guaranteed to learn something from every episode. You may know him as one of the stars of the mega-hit TV show Impractical Jokers on True TV, but James Murray is an accomplished writer and bestselling author, executive producer, actor, development executive and so much more. He shares with Carol Roth the path to making it big- and how to stay humble during the process, how to define success, how comedy and horror relate to each other and so much more. Come for the laughs and the behind-the-scenes gossip and teasers– and stay for the amazing life advice in this rich conversation. From the scandals of Harvey Weinstein and Jeffrey Epstein to Matt Lauer and more, one man exposes the dirty secrets of the Hollywood and political elite before the main stream media – “Enty Lawyer” from CrazyDaysandNights.net. Enty joins Carol to share the history of the site and its transformation from niche blog to the home of breaking scandals and why he roots for the underdog. Plus, we dive into the scandals regarding Harvey Weinstein, Jeffrey Epstein, Michael Jackson, Bryan Singer and more of the dirty world of the powerful and famous. Our addiction to social media has created a lot of issues to contend with, both personally and as a society. Writer and Host of “Walk-ins Welcome”, Bridget Phetasy, joins Carol two weeks into her Twitter sabbatical to share what she has learned about how we are communicating these days and its effect on everything from politics to relationships. Plus, Carol and Bridget the changes that need to be made to post-secondary education. In an effort to get out of the “echo-chamber” of like-minded thinkers, Carol talks with Tara Dowdell, President of Tara Dowdell Group, a business and political marketing firm, former government and campaign staffer and TV commentator about why the ultra-progressive part of the Democratic party is gaining momentum and what we can do- if anything- to heal the political divide. Has social justice become unjust? Carol is joined by Noah Rothman, The associate editor of Commentary, a contributor to MSNBC/NBC News, and the author of Unjust: Social Justice and the Unmaking of America to talk about how the quest to make things better for some has only made things worse and what we can do about it. Carol talks to Sarah Colonna, comedian, New York Times bestselling author, writer, entrepreneur and actress from shows like Netflix’s Insatiable and Showtime’s Shameless about what it is like to do comedy in an age of politically correct outrage, the perils of social media and her new business, Clutch Women (ClutchWomen.com). 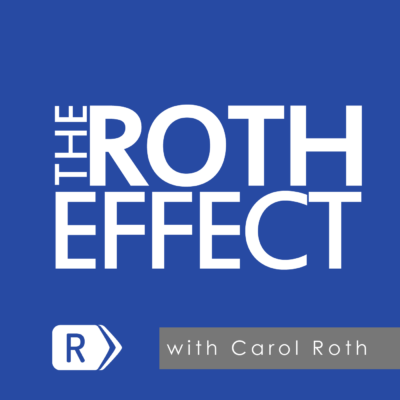 Carol Roth is joined by media reporter and columnist for The Hill, Joe Concha, to talk about real media bias and the blurring between journalism and punditry, plus the role of social media in creating an unhealthy attention economy for those in the media. After nearly a decade in the media, Carol Roth was frustrated by traditional formats that only allow for talking points and cursory debate around important issues- if discussing them at all. This podcast is the antitdote: a free-form, not politically-correct discussion rooted in reason- and some humor- around thought-provoking topics. Carol and her guests will cover current events and politics, individual rights, business, entertainment and more. You’re guaranteed to learn something from every episode.